Colorado offers endless and one of finest nature photographic opportunities with all the glory of Fall season. 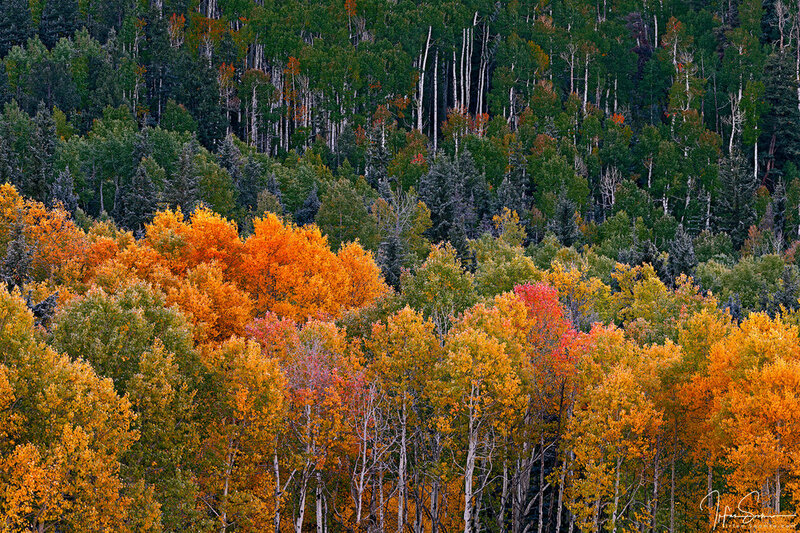 Aspen lovers specially get addicted to this area for a reason. This workshop is geared toward capturing this beauty of CO’s fall colors from well-known town of Aspen CO to Ouray, Telluride and adjoining areas. I have photographed extensively in this area and scouted for the best opportunities and can safely assure there is no shortage of subjects. This 5 Day On Location field workshop is offered at $1,495 per person. The workshop will commence pre-sunrise on Friday 09/28 in Aspen, CO photographing the famous Maroon Bells and end in or about Telluride, CO around dusk on Tuesday 10/02. During the five-day workshop we will follow a loosely defined itinerary. This is to ensure the group has flexibility to adapt and follow the peaking colors as reports come in on daily basis. In general, we will start North and work our way South, based on colors. We will photograph in San Juan mountains, mountain passes and number of back country roads (known and not so well known). As we near the work shop dates I will also send out more details program. I can send details about possible lodging, accommodation what to bring etc. to participants. Do note this workshop will require considerable driving. The nearest airport to Aspen is Denver, a 3.5 hour drive, then Aspen to Telluride or Ouray is about 4 hours and from there back to Denver about 5 hours. This is an instructional based and very hands on workshop. We may do minor hiking but will not be strenuous by any means. We will photograph during the best lights and meet for “Image Review and Critique” sessions during mid days. Throughout the workshop we will discuss artistic and technical aspects of photography. Topics like camera settings, right tools for a given scene, field techniques and tips, composition and other questions you might have. I am also open to discussing additional topics throughout the workshop like Developing Personal Style and Vision, Self-printing, Soft Proofing for commercial lab printing, social presence, marketing and selling fine art. Irfan Soomro Photography is fully licensed and insured business, conducts workshops with applicable permits and operates under the rules and regulations of the respective park services like State Parks or National Park Service etc. To reserve a seat or have any question you can reach out to me via my home page or message / call me at my cell: 425-891-1362. Once I receive registration request I will send you invoice to process payment. I hope you are able to join me to photograph some of the best fall imagery of US and look forward to helping you take your photography to next level. This 5 Day workshop is priced at US $1,495 with 50% payment due at registration to secure your seat and balance 50% due by May 15th, 2018.